Neat-looking “closed cell” stratocumulus clouds were diagnosed in GOES-16 visible satellite imagery in the eastern Pacific Ocean off the coast of Baja California during the day on 31 October 2017. These cloud formations typically form under high pressure and calm winds. Rising warm air in the center of each cell sinks on the edges, creating the darker/less reflective areas. A winter storm brought snow and freezing drizzle to parts of southern Colorado 30-31 October 2017. During the evening of the 29th, a cold front brought temperatures down into the 30s and 40s after a day of 70s across the plains. A low stratus deck developed within northeasterly upslope flow behind the front across the plains by sunrise. GOES-16 visible imagery during the morning of the 30th revealed quite a bit of interesting features atop the stratus deck. First, the westward-bound sea of stratus was stopped by the Sangre de Cristo (southern Colorado) and Sawatch (central Colorado) mountain ranges. The low clouds can be seen creeping into the valleys of the Sawatch range. In many areas atop the stratus deck, particularly over the plains, small wavelength waves/ripples are seen, exhibiting the high degree of stability. Downstream of mountain peaks poking through the cloud deck, V-shaped wave features emanate in a manner similar to an obstruction in a stream. Upper-level contrails flow into the scene quickly from the west, casting a dark shadow on the stratus deck. During the morning of 29 October, Tropical Storm Philippe raced northeast away from the Florida coast. GOES-16 VIS/IR sandwich shows the center of circulation clearly with convective activity displaced well to the northeast (Fig. 1). Philippe is expected to become post-tropical today and be absorbed into an approaching negatively-tilted trending trough and rapidly developing surface low over the northeast. This system is expected to produce heavy rainfall over the northeast US given abundant tropical moisture feeding into the system. In fact, satellite-derived blended TPW indicates column moisture over 200% of normal this morning from off the coast of Florida into Canada north of New York (Fig. 2). GOES-16 derived winds outline the east coast upper-level trough and embedded jet pattern. A 300 mb jet max of around 150 knots is already measured over Pennsylvania advancing into New York, the timing of which is slightly ahead of the strengthening indicated in the models. The winds also outline the development of the baroclinic leaf structure (Fig. 3). Strengthening and progression of the east coast storm system SUnday through early Monday morning can be analyzed in GOES-16 upper-level water vapor imagery (Fig 4). The atmosphere was very dry across the US Great Plains Friday behind the storm system that passed through the previous day. In fact, a corridor from North Dakota through Kansas measured TPW <30% of normal, with GOES-16 derived TPW indicating values around 0.1 inches. The dryness was apparent in GOES-16 imagery as well. The 7.34 um “Low-level Water Vapor” IR and 1.38 um “Cirrus” NIR channels are both sensitive to absorption by water vapor in the atmosphere, and therefore typically do not sense surface features. Both channels did on Friday, with the Missouri river standing out across the Dakota’s. A long line of severe storms impacted a broad region extending from Texas to Wisconsin on 21 October 2017. The destructive storms developed along a cold front in association with a high amplitude large-scale trough advancing out of the Rocky Mountain region. Ahead of the cold front, strong southerly flow drove anomalously high levels of moisture north, and combined with warm temperatures, led to a long corridor of high instability. Deep layer shear under strong flow aloft also supported the development and maintenance of robust updrafts. The strongest of storms were centered in Oklahoma where the greatest instability developed, necessitating an SPC Enhanced Risk for Severe Thunderstorms. Initial, large-hail-producing supercell thunderstorms transitioned to linear modes and a damaging wind threat as the cold front pushed southeast. Given the severe risk, a GOES-16 1-min Mesoscale Domain Sector (MDS) centered over Oklahoma was requested by the Storm Prediction Center. GOES-16 imagery and products provided forecasters with valuable information even before the first storms develop. Water vapor imagery revealed the progression and amplification of the upper-level trough through the Rocky Mountain Region during the previous evening and morning hours (Fig 1). 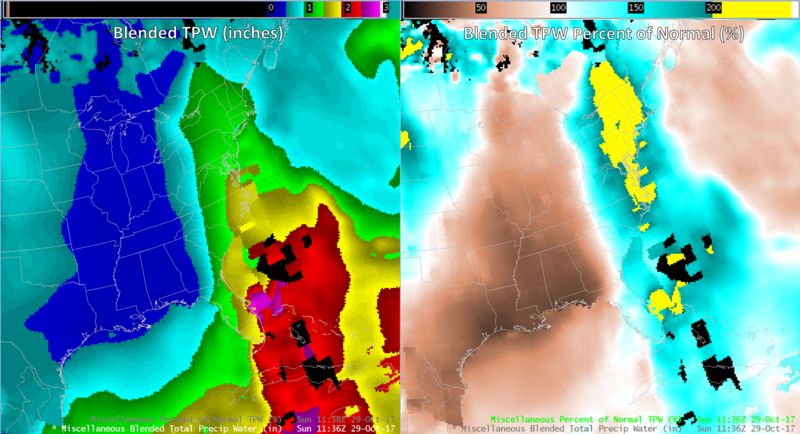 Prior to initiation, increasing moisture and instability was analyzed in GOES-16 TPW and CAPE fields (Fig. 2). Strengthening deep layer shear could be diagnosed in Oklahoma using the Derived Motion Winds (DMWs) and surface observations (Fig. 3). Careful analysis of GOES-16 1-min visible imagery reveals areas where the atmosphere is destabilizing and convective initiation is becoming imminent (Fig X). Ahead of the cold front, transition of low stratus stable wave clouds (perpendicular to low-level flow) to cumulus cloud streets (parallel to low-level flow) indicated destabilization was taking place, but that the atmosphere was still capped. The exact location and progression of the cold front was easily tracked in the visible imagery among the abundant high and low clouds. Convective initiation appeared more and more likely as cumulus clouds along the front exhibited increasingly vertical growth. 1-min imagery from GOES-16 is the first indicator that convective initiation is about to occur or is occurring. As can be seen in Figure 5, convection developed quickly along and ahead of the cold front during the mid afternoon hours. Creative displays allow forecasters to extract the maximum amount of useful information from GOES-16, quickly. The VIS/IR image sandwich combo combines the high resolution VIS with the quantitative information from IR into one display (Fig. 6). This image combo allows a forecasters to effectively monitor the health and evolution of a storm through the analysis of relevant storm top features and processes such as overshooting tops, enhanced V’s, cloud top cooling, and cloud top warming. GOES-16 IR window channel shows convection develop and quickly organize into a quasi-linear convective system along the cold front (Fig. 7). The TPW, CAPE, and DMW products should continue to be monitored for information about the environment into which mature storms are moving. GOES-16 Derived Motion Winds (DMW’s) have been available to forecasters in AWIPS for a few months now. 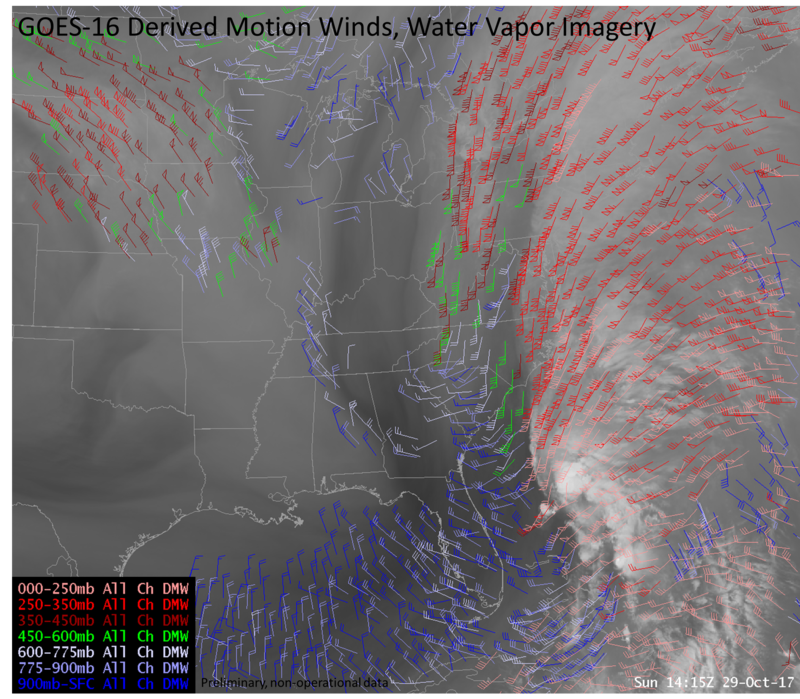 These winds are computed from the motion of clouds and moisture features in satellite data. 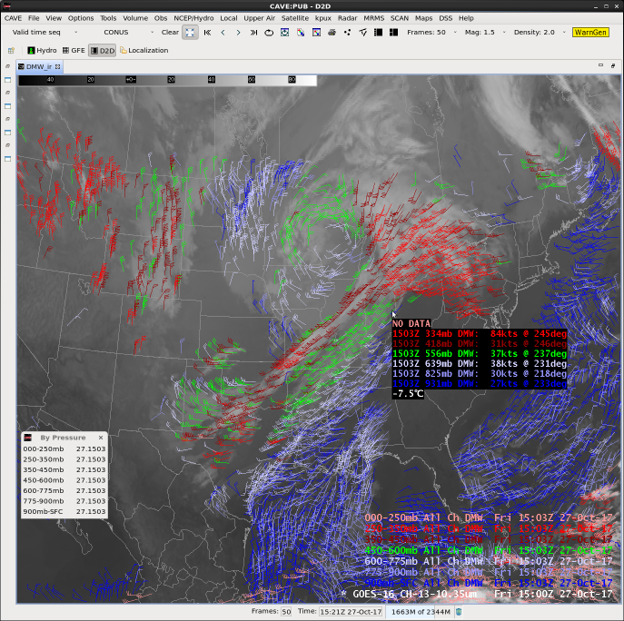 Given the higher spatial, temporal, and spectral resolution of the GOES-R ABI, more winds can be computed spatially and vertically than with previous GOES satellites. These winds can be quite beneficial to forecasters. A few examples include: gauging NWP model performance, identifying localized jet streaks, and computing layer shear. Unfortunately, the initial display of the winds in AWIPS-II leaves something to be desired (Figure 1). Loading each individual layer of winds yields three products: <30 knots, 30-50 knots, >50 knots. I believe this is unnecessary considering the wind bard itself tells you the speed. One product for all the winds in that layer would suffice. When loading all layers, the list is quite large. These barbs are color-coded by speed. I would prefer to load each layer of wind data, and have them color coded by layer. As for sampling, the pressure level of the individual wind is not included, and the direction and speed not labeled. Figure 1: 1933 UTC 19 October 2017 GOES-16 Derived Motion Winds (barbs), IR imagery (image), and point sampling. This is the current display in AWIPS-II. I decided to have some fun and make these changes myself (Fig 2). I load only one product per wind layer, and color code by layer. In the sampling, I include the pressure level of the individual wind, and I label the direction (degrees) and speed (knots). This display is much cleaner and more useful to the forecaster. If you have any suggestions, feel free to let me know! Figure 1: 1933 UTC 19 October 2017 GOES-16 Derived Motion Winds (barbs), IR imagery (image), and point sampling. This is a proposed display in AWIPS-II. As of 30 October, the proposed winds display has been further modified (Figure 1a). The GOES-16 Derived Motion Winds highlighted some of the key ingredients on 10/20/2017 that would lead to widespread severe storm development the next day across the southern plains (Fig. 3). The winds outlined an upper-level trough digging through the western US. Advancing into the scene toward northern California was a strong upper-level jet, with a couple barbs over 130 knots. This verifies the strength and timing of the 18z GFS NWP model forecast of the jet progression. Further east from Texas north through Oklahoma and Kansas, potent low-level return flow of 20-35 knots was analyzed in the wind field. Wildfire Smoke Tracing Up-Valley/Down-Valley Winds. The wildfires across California have been covered extensively by the news and social media lately. The Lion wildfire had burned 15,450 acres by early 13 Oct 2017 in Tulare County in central California. This wildfire was in a remote area in the southern Sierra mountains in the Sequoia National Forest, so firefighters would let it burn. It’s position in the middle of the Kern River valley and abundant smoke provided a great visualization of up-valley/down-valley winds (Fig. 1). Figure 1: Graphical depiction of mountain valley winds courtesy of COMET. At night well after sunset and under an inversion, draining of cold air off the slopes (katabatic winds) converges in the valley and creates relative high pressure, accelerating down-valley. During the day, the slopes and valley floor are heated, creating relative low pressure and upslope and up-valley flow. The smoke from the Lion fire could be seen flowing down-valley just after sunrise in GOES-16 visible imagery (Fig. 2). After a few hours of heating under clear skies, the smoke reverses course and begins to move up-valley. The inversion eventually breaks leading to smoke being dispersed out of the valley as well. 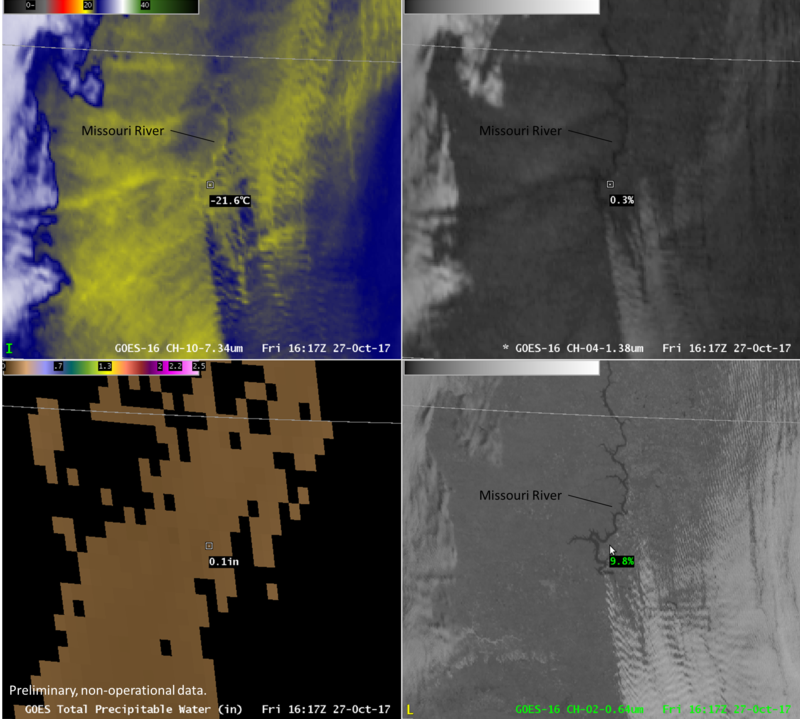 The high temporal (5-min) and spatial (0.5 km) resolution from GOES-16 visible imagery and presence of wildfire smoke allowed for this mountain meteorology process to be clearly visualized. Such a reversal of winds in the vicinity of a wildfire is important information for firefighting efforts.